Additional Info: A very popular belief among Vietnamese is the custom of the ancestor cult. In every household, an ancestor altar is installed in the most solemn location. Most visitors to Vietnam, except citizens of Nordic or ASEAN countries, South Korea and Japan, require a visa in advance. A single-entry tourist visa valid for 30 days costs around $35 (although exact fees vary depending on issuing country) and takes around 4-7 days to process; express visas take 2-3 days at twice the price. Visas are now generally valid for all entry and exit points. The most popular Vietnam biking trip is from Hanoi to Saigon (Ho Chi Minh City). The total distance is 1,200 miles, and on most tours covered in 14 days. Most tours include time to discover Hanoi before heading away from the city. Some tours include other means of transportation such as minibus, train, or flight over parts of the route, some include for you to cycle the whole journey. Cycle back roads through some of the country's most beautiful scenery and natural surroundings while breathing the cool fresh air from beaches and countryside of Vietnam. Some of the roads are very rough and some parts of the way head through heavily trafficked areas. Daily rides will vary from 60 miles to 110, if you go with an arranged tour (the preferred method) and dependent on the difficulty level involved on those days. The locals are ever-curious about the typical Americans, from your hair and skin color to your language and clothing, although they all respond happily to a large pleased-to-meet-them smile. As you cycle along the old bridges and trails, you will still see some lingering signs of the US-Vietnam war, such as large bomb craters near bridges and damage to some older buildings. Saying that, the war is not a major pat of Vietnam or any tour through this land; people have commented that it is even easy to overlook considering it only took place 35 or so years ago. Other tour operators offer mountain biking Vietnam trips, including: Hanoi and Saigon, the Red River Delta and Cuu Long where the banks are farmed by generations of peasants, bike amongst massive limestone mountains with ancient forest, jungle and steep rice terraces, cultivated by hill tribes as they have been for thousands of years. 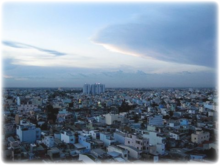 Vietnam is the 13th most populous country in the world. With 13,000 floral species and over 15,000 fauna species, three newly discovered big animal species, and a ratio of country/world species of 6.3%, Vietnam has enormous tourism - particularly ecotourism. 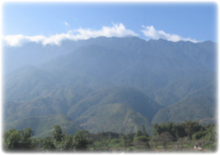 Sa Pa (or Sapa) is a frontier town and district in the Láo Cai province in northwest Vietnam. It is one of the main market towns in the area, where there live many local trades such as H'mong, Dao and Tay. Try taking a walking tour here to the hill tribe villages of Cat Cat, home to the H'mong hill tribe minority peoples. 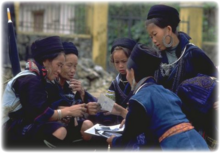 You will meet some of the local minority people on their way to and from Sa pa and possibly have the opportunity to share cultural experiences with the families that live in the area. Also, try taking the 3-4 hour trek along the buffalo paths and trails and through several hill tribe villages of Lao Chai and Tavan - a spectacular walk through stunning scenery inhabited by some of the friendliest people. Ha Long - In the south of the city there is Bai Tho Mountain with its almost vertical seaward face, which was widely used by some famous local poets. The limestone peak is rich in bio-diversity and offers attractive views of the bay. Cruise the Bay's 2000+ magnificent islands and islets, try the local seafood and discover one of the many mystical caves. From the center of Hue, you can board a dragon boat and travel on the scenic Huong River to Thien Mu pagoda (built in 1601 by King Nguyen Hoang), followed by a visit to the impressive tomb of King Ming Mang. The Mekong Delta (Nine Dragon river delta) is the region in Southeast Vietnam where the Mekong River approaches and empties into the sea through a network of tributaries. The Mekong delta region encompasses a large portion of southeastern Vietnam. The area covered by water depends on the season. A great location to hire a private boat cruise or cruise along the small and picturesque tributaries by rowing boat. Fansipan is the highest mountain in Indochina, at 3,143m (10,311ft). It is located in the Lao Cai province in Northwest Vietnam, 6 miles southwest of Sa Pa Township in the Hoang Lien Son Mountain Range. Fansipan is dubbed "the Roof of Indochina"; it is to be approved as one of the very few ecotourism spots of Vietnam, with about 2,024 floral varieties and 327 fauna species. A climb (trek) such as this, remote and picturesque, offers plenty to see and enjoy, from the scattered rocks inscribed with drawings and designs of unknown origin, to the retreat town of Sa pa, with its minority groups, beautiful villas and cherry forests. Ascend through the lower reaches of Fansipan where you will traverse alongside terraced rice paddies and villages of the H'mong (hill tribe minority peoples). As you climb/trek to the higher reaches, you will start to see giant, centuries old pine trees and expanses of yellow bamboo, as well as mountain goats and even Langur monkeys. Flora and bird enthusiasts will love the sights of rhododendrons, luxuriant ferns and orchids this climb offers, as well as many beautiful birds. Layer upon layer of green ridges fade into the distance, edged by sharp, rocky peaks. The region is home to several ethnic minority groups all wearing their traditional and colorful attire. It takes about 3 days to make it to the top of Fansipan and back to the town of Sa pa. The top is accessible year-round to anyone, assuming good health. There are no mountain huts on the journey, so camping equipment is needed. Among many of the beautiful sea kayak trips available in Vietnam is the opportunity to explore the legendary and UNESCO world heritage sight of Ha long Bay. 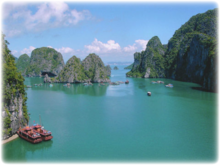 Halong bay has the typical diurnal tide system. Kayak to nomadic traditional fishing villages, paddle into splendid and often hidden sea-caves, discover exquisite lagoons, and stare up at the beautiful and inspiring sheer limestone islets soaring above the sea. Spend time cruising and kayaking around Van Gia Island; follow a string of islands, taking time to stop and sun and swim on shell beaches, and explore small sea caves and hidden coves. 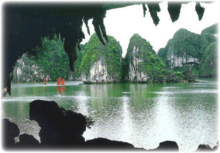 At Nui Ngoc Island, paddle through the giant cave to one of the most beautiful areas in Halong Bay. Take your kayak where few tourists get to go, arrive at the beachside Ba Men Temple, dedicated to the whale gods. At the Three Lagoons begin an exploration of Bau Be Island. There are a few small, isolated beaches where you can hide out and swim, sunbathe, and explore. Continue on to the island's most beautiful floating village, and try not to miss the amazing Black Cave. There are so many seldom visited unique caves and beaches to explore - come back and share your kayak stories with us.